LED lights underneath the skin light up the manikin chest, through the carotid arteries and into the brain when CPR compression depth, compression rate and recoil are done correctly. NEW Adult CPR Manikin with LED Light CPR Feedback, shows the blood flow to the brain when giving CPR correctly. Winner of the 2016 iF Design Award for Medicine & Health. LED lights underneath the skin light up from the manikin chest, through the carotid arteries and into the brain when CPR compression depth, compression rate and recoil are done correctly. This instant visual feedback gives students immediate corrective feedback to their CPR compressions, improving their skills quickly and resulting in more effective life-saving CPR. LED light progression from the chest to the brain also reinforces the critical learning objective of the importance of CPR. Students get it; teacher is happy. Instructors know the importance of proper CPR. But it's nearly impossible to evaluate and correct the CPR skills of an entire class of students; simultaneously. The new LED CPR feedback manikin, provides individual CPR feedback to each student, helping them to quickly master the skill of CPR. 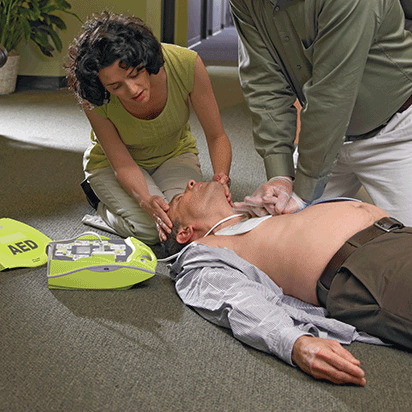 So now; instructors and students, have a fun and effective way to learn CPR, correctly. How it works: LED's light up underneath the manikin chest when the correct compression depth and recoil is given. LED's flow from the heart towards the brain when the correct compression rate (100 - 120 compressions/ minute) is applied. LED's light up the brain only when the correct depth, recoil and rate is applied to the manikin. Anatomical landmarks, including the sternum, rib cage, sternal notch, and xiphisternum. Audible feedback (clicker) helps to reinforce the correct compression depth. Highly realistic chest rise when the student performs correct ventilations. Oral and nasal passages allow for a realistic nose pinch, required for proper mouth-to-nose ventilations. Realistic head tilt and chin lift for opening the airway. BigRed™ CPR Manikin with LED Light CPR Feedback - Adult is rated 4.6 out of 5 by 12. Rated 5 out of 5 by AnneS from excellent we love this manikin. It works great. They only recommendation would be to include the AC adapter cord. I cannot find where to buy it and I would have paid more to have it included. Rated 5 out of 5 by Jennifer Ellinger from excellent training makikin I just purchased one of these Manikin and love it for training my staff. Did have a small issue when it arrived as the carrying bag was not with it. Called red cross and got this fixed and they over nighted me the carrying bag. Rated 4 out of 5 by Marcycpr from Shows what CPR DOES! I developed this idea/design 10 years ago but never got to the manufacturing stage. I am pleased that someone else brought it to market! My first one (when it 1st came to market) broke after 2 uses and for costing over $500, I was very irritated, but the newer model seems to work well. Rated 5 out of 5 by Laura Seeley from Great Upgrade Love the features on the BigRed Manikins. It really helps the instructor gage whether the student is performing the skill accurately. Rated 5 out of 5 by Joey5401 from The manikins are excellent training tools We purchased four of them for our organization. The excellent training tools as they give the student more confidence. Rated 5 out of 5 by GRWP18 from Interesting Its the talk the facility. We enjoy using the product for it helps us better our compression. It enables us to practice how "real" compressions feel like. Rated 2 out of 5 by Zimms from It is ok, not sure worth the price After originally receiving my order I could not get the forehead lights to go on when I was compressing. I received a replacement with the same problem. After watching a youtube video it turns out you almost have to bounce taking your hand off in between compressions to get the whole thing to light up. When it does it is neat to see but not easy, and you have to have your hand placement exactly in the right spot (which is not necessarily exactly where you would do compressions) to keep it lit up. It is heavy and hard to compress and really hurts your hand after a bit. The Red Cross was not able to aid with help on the lights issue and the company that makes these is in Korea so I could only email them. I would love to see it become much more user friendly, better battery option or at least come with the plug in that it has an option for, and lower the cost. I bought one but would never take it on mobile trainings, too bulky and too expensive and would not purchase more then one.